TALLADEGA, Ala. – It was an Earnhardt behind the wheel and it was at Talladega and one of the places that helped make his father a legend in the sport of NASCAR had a grand parting gift for the son. Talladega Superspeedway officials, in conjunction with the International Motorsports Hall of Fame and the state of Alabama, handed Dale Earnhardt Jr. the keys (figuratively speaking) to the 1979 Chevrolet Monte Carlo that his father drove to the Rookie of the Year title that year, and possibly wheeled in a few ’80 races as well. Earnhardt the elder won the first of his seven Monster Energy NASCAR Cup Series titles in ’80 while driving for team owner Rod Osterlund. 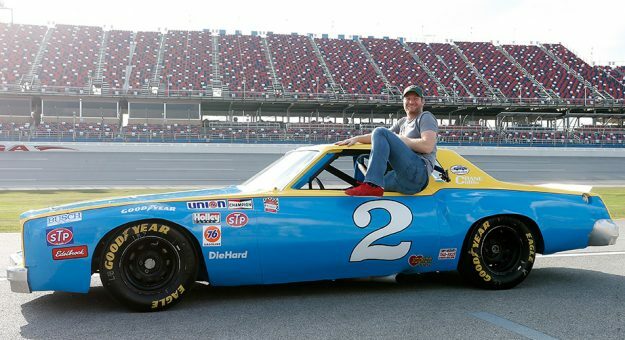 “This car is a 1979 Monte Carlo,” a beaming Earnhardt Jr. told NBC after taking the car for a spin on the 2.66-mile Talladega layout. “Dad drove this car in his rookie season; he probably ran it in his championship season too in 1980. The International Motorsports Hall of Fame is located on the grounds of Talladega Superspeedway. After climbing behind the wheel, Earnhardt Jr. drove the blue and yellow Monte Carlo, with its long front end and No. 2 emblazoned on the sides, at only moderate speed for a couple of laps around the track. But he did make a quick side trip after starting down pit road to drive it through the Monster Energy Series garage before heading back down pit road for pictures with dignitaries and a quick interview. “Actually the state of Alabama owns this car,” Earnhardt Jr. said. “They’re going to let us take it to Mooresville, North Carolina, and show it around in our shop so that’s going to be fun for the guys. In addition to the permanent loan of the vehicle, Earnhardt was presented two unopened magnums of champagne by track officials. The first was from the lot that was used during his father’s final victory here in 2000; the second came from the post-race celebration following Earnhardt Jr.’s first Talladega win in 2001. Earnhardt Jr. said he did get the opportunity to drive his father’s race cars previously, but none of the older models. Earnhardt Jr. will make his final Talladega start Sunday when the Alabama 500 gets underway here (2 p.m. ET, NBC, MRN, SiriusXM NASCAR Radio). Six of his 26 career wins have come at Talladega.